LOUISVILLE, KY (MAY 16, 2017) – The field for the 142nd running of the Preakness Stakes will not happen until Wednesday at Pimlico Race Course in Baltimore, MD. The draw is expected to occur at 5 p.m. ET. Impressive winner of the Kentucky Derby just two weeks ago at Churchill Downs in Louisville. After popping out of the gate quickly, Hall of Fame rider John Velasquez moved his colt early to ensure he got into a forward position and then dropped over to the rail, just behind State of Honor and the “garden spot” of the wet track all week long. With about 51/2 furlongs to go in the 11/4-mile race, Always Dreaming easily took command. From there, the duo of rider and horse were never in danger of losing the lead and galloped off to an impressive 23/4-length victory. He is now an undefeated 4-for-4 going a route of ground, and around two turns – which is exactly what the Preakness Stakes is, too. Always Dreaming has won those races four races by a total of – get this – 231/4 lengths. Race Record: 6-4-1-1…With impressive victories in the Grade 1 Florida Derby and the Grade 1 Kentucky Derby. Trained by Todd Pletcher – who has never won the Preakness Stakes, but normally points many of his top 3-year-old colts to the Belmont Stakes, instead. His best finish was in 2000, with his first try. Impeachment ran third that year to Red Bullet, and Derby-winner Fusaichi Pegasus. Riden by John Velasquez – who has not won a Preakness, either. His best finish was second aboard Itsmyluckyday, who ran behind Oxbow in 2013. Sire: Bodemeister, who won the G1 Arkansas Derby before running a game second in the Kentucky Derby. Bodemieister is by Pioneerof the Nile, who sired Triple Crown winner American Pharoah. Had a very troubled trip in the Kentucky Derby. Irish War Cry broke sharply to the inside at the start, slamming into McCraken, who, in turn, slammed into Classic Empire. Classic Empire fell to 13th early on – not where either he, nor jockey Julie Leparoux, wanted to be. And, Classic Empire – winner of the 2016 Breeders’ Cup Juvenile and the 2017 Arkansas Derby – spent the rest of his day paddling throw the wet track and around horses only to get up to 4th. A better trip in the Preakness definitely could mean a better result. Won the Breeders’ Cup Juvenile in his first try ever around two turns, and, despite a few hiccups along the way this spring, Classic Empire showed up at the Arkansas Derby with something to prove. And, he did, rallying from off the pace to impress the fans and horse players, alike. Race record: 8-5-0-1 – with wins in the G3 Bashford Manor, G1 Breeders’ Cup Juvenile, G1 Breeders’ Futurity and G1 Arkansas Derby. Arguably the most accomplished runner in this year’s Preakness field. Ridden by Julie Leparoux, who has never won a Preakness, either. Leparoux was second with Macho Again in 2008; 9th with General Quarters in 2009; 11th with Pleasant Prince in 2010; 4th with Dialed In in 2011; 9th with Daddy Nose Best in 2012; 9th with Titletown Five in 2013; and 6th with Danzig Moon in 2015. Sire: Pioneerof the Nile, who, as stated above, is the sire of American Pharoah. Enough written. Dam: Sambucca Classica, who has already produced three stakes winners. The others, though, are classy sprinters – including Uptown Twirl, Anytime Magic. This talented colt – who sold at Keeneland as a yearling for $200,000 by consignor Hill n’ Dale Farm — skipped the Derby and was pointed to the Preakness by trainer Chad Brown after finishing a game third to Irish War Cry and Battalion Runner in the Wood Memorial. He was beaten seven lengths that day, but drifted in and then out in the latter stages. That race was only the third start ever for Cloud Computing, and came on the heels of an aggressive spot – a second place run in the G3 Gotham after a maiden victory. Gets a huge jockey change today to Javier Castellano, who jumps off of Gunnevera after the Derby. Race record: 3-1-1-1, with only a MSW victory at 6 furlongs to his credit to date. Trained by Chad Brown, who is still only 38 years old, worked for Hall of Fame conditioner Shug McGaughey and the late Bobby Frankel. Brown went out on his own in 2007 and got his first win with Dual Jewels at Churchill Downs. In 2012, Brown started his first horse in a Triple Crown race when Street Life ran fourth in the Belmont Stakes. Normandy Invasion ran in the Derby in 2013, followed by My Man Sam and Shagaf in 2016 and Practical Joke this year. This will be his first horse in the Preakness. Ridden by Javier Castellano – elected to the Hall of Fame this year. Castellano won the Preakness with Bernardini in 2006, was 10th with Aikenite in 2010, fourth with General A Rod in 2014, third with Diving Rod in 2015 and 10th with Collected last year. Sire: MacLean’s Music, a son of Distorted Humor, who won his only start for trainer Steve Asmussen and owner Stonestreet Stables. Dam: Quick Temper, an A.P. Indy mare who had a record of 4-6-5 in 26 lifetimes starts and earned nearly $260,000. Nearly pulled off a shocking win in the G1 Arkansas Derby, at offs of $17.60-1, and would have if not for the late surge by Classic Empire. Ran almost the same race in the Sunland Derby, nearly making the lead before giving way to the eventual winner, Hence. Before that, the colt reeled off three wins in a row to begin his career, all at little Sunland Park in New Mexico – the racing home of Mine That Bird. This horse was first sold as a yearling at Fasig-Tipton’s select sale at Saratoga, and brought a sum of $180,000 – purchased by Conquest Stables. The consignor was Sequel Stallions New York. A year later, he was sold at Keeneland November, as a part of the Conquest Stables dispersal, for just $8,500. Not a bad purchase by Judge Lanier Racing – the current owners. He arrived at Pimlico this week after a two-day, 15-hour van ride from Prairie Meadows Racetrack in Altoona, Iowa. Race record: 5-3-2-0, with earnings of $508,900. If this horse had stayed in the hands of Conquest Stables, who dispersed all of its horses over a year ago, Mark Casse could have himself another shot at the Preakness. Trained by Miguel L. Hernandez, has never had a starter in the Preakness. Ridden by Jorge Carreno, who grew up in Mexico and is the son of a former groom, has never had a mount in the Preakness. His lone Graded Stakes win came with Toccetive in the G3 Canadian Derby at Northlands Park in 2012. He came to this country in 2002. Sire: Uncle Mo, who has rapidly become one of the most prodigious and productive sires in the world after a brilliant racing career – which saw him win five times in eight starts, with one second and one third and earn over $1.6 million in purses. For his efforts, he was named the 2010 Champion 2YO colt. Now, he may be one of the best sires standing in North America. He is the sire of Nyquist, from his first crop, and has already sired many Graded Stakes winners – especially at a distance. Dam: Stirring, by Seeking the Gold. She did not race, but her mother sure could run. Daijin was Graded Stakes placed and had four firsts and two thirds in nine lifetime starts – including a third in the G1 Test Stakes. The third dam is Passing Mood, who was a SW – with three firsts, a second and a third in only nine lifetime starts. She won the Shady Well Stakes at Woodbine. The fourth dam was Cool Mood, a Canadian-bred daughter of Northern Dancer and a multiple stakes winner. After two tough races in a row (the Kentucky Derby and the Florida Derby), the bloom may be off this rose. If it isn’t, at least his former rider is. After a getting stuck on a muddy track and behind a wall of horses early, Gunnevera plodded home with a non-threatening 8th in the 20-horse Kentucky Derby. It didn’t take much longer than the race time itself for regular rider, JJ Castellano, to announce that he was switching gears and horses. He is now named to ride Cloud Computing. Trainer Antonio Sano didn’t get stuck without a top hand for long. 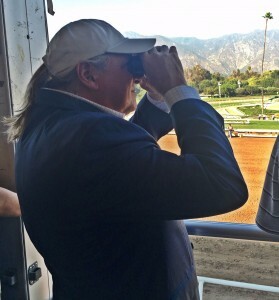 A day later, it was announced that Mike Smith would be in the irons for the Preakness. Smith — a Hall of Fame rider who is the regular rider on Arrogate, and Songbird and was the pilot for host of former champions, such as Zenyatta — is known for his patience and his riding style. And, Smith will get a horse that despite his poor luck in the Kentucky Derby does have both talent and grit. Three races back – before a horrendous post position all but eliminated any chance he had in the Florida Derby, and terrible traffic issues in the Kentucky Derby – Gunnevera stamped himself as one of the top horses in this crop of 3YOs. He won the Fountain of Youth at Gulfstream Park with a closing kick that inspired hope and caught attention. It was reminiscent of his furious closing rally to win the Delta Jackpot to close out his 2YO campaign. If Gunnevera can find the right post, the right path and the right track surface again – all at once – watch out. Race Record: 10-4-2-1 with earnings over $1.2 million. Trained by Antonio Sano, a native of Venezuela, has never had a starter in the Preakness Stakes. Ridden by Mike Smith, will be making his 16th appearance in the Preakness. Smith won the Preakness in 1993 on Prairie Bayou, and was second with Bodemeister (sire of Always Dreaming) in 2012, and with Mine That Bird in 2009. Strangely enough, the ride on Mine That Bird came open after the horse won the Kentucky Derby, when regular rider Calvin Borel chose, instead, to ride the filly Rachael Alexandra – who just so happened to win the Preakness. Sire: Dialed In, who finished 4th in the Preakness Stakes in 2011 with Leparoux on his back. He won the Florida Derby, before running 8th in the Kentucky Derby . He was the leading freshman sire in 2016. Dialed In, who stands at Darby Dan Farm in Lexington, is by Mineshaft, who stands at Lane’s End Farm in Versailles. Dam: Unbridled Rage was unplaced as a runner, but is the dam of Minstrel Queen – a Grade 1 winner in Puerto Rico going a route of ground. This colt was bred and is still owned by famed Calumet Farm in Lexington. He jumped off the charts and into the Kentucky Derby by virtue of his commanding performance in the G3 Sunland Derby. The deep closer came from far back early on to beat Conquest Mo Money and Hedge Fund in New Mexico. Hence didn’t have much of a chance, nor much of a serious run in the Kentucky Derby two weeks ago, when he finished 11th and was beaten over 18 lengths. He was in tight early on and fell far off the pace, but then encountered more trouble when he was steadied at the 5/16ths and nearly clipped heels. In other words, he wasn’t much of a factor. But he may be more seaworthy this Saturday, especially if the track turns up wet. Hence – who was highly touted on the Churchill Downs backside leading up to the Derby – broke his maiden in the slop at Oaklawn Park this January. Trained by Steve Asmussen, who has already won two previous runnings of the Preakness Stakes. Asmussen saddled Curlin, who won here in 2007, and the filly Rachael Alexandra in 2009. Going into this Saturday, Asmussen has had six Preakness starters. Daddy Nose Best was the most recent in 2012 and he finished 9th that year. Asmussen was 3rd in 2011 with Astrology; 5th with Snuck In in 2000; and 5th with Easyfromthegitgo in 2002. Ridden by the Frenchman, Florent Geroux. Rode his first Preakness starter a year ago, finishing 6th aboard the maiden Laoban. Sire: Street Boss, who was a multiple G1-winning sprinter, but never raced farther than 7 furlongs. He can get a G1 router, though, proven last year when his daughter, Cathryn Sophia, won the Kentucky Oaks. Dam: Floating Island had runner-up finishes in two of six career starts and she has produced three winners from six foals. Her best foal, other than Hence, is Conquest Stormy, who finished second in a turf stakes. This colt, who is a deep closer, got a dream trip from jockey Corey Lanerie, despite breaking from the dreaded No. 1 post position at Churchill Downs in the Kentucky Derby. And, he ran a huge race, despite the $33.20-to-1 odds. At one point, jockey Corey Lanerie thought he may have a shot to win the race, but he had to settle for second – beaten only 23/4 lengths. Lanerie, who was on “The Pressbox Live” audiocast earlier this week, said he thought he was going to win inside the 1/8th pole, but that his horse couldn’t close any further ground on the Derby winner Always Dreaming. Lookin’ at Lee isn’t without strong credentials of his own, despite the long odds in the Derby and the longer odds of Derby runner-ups in the Preakness. He was very impressive in the G1 Arkansas Derby, losing by only 11/2 lengths to Classic Empire then, and, before that, in the Breeders’ Cup Juvenile, when he lost to Classic Empire by 12 lengths after a troubled trip. Lookin’ at Lee is, without a doubt, a deep closer. That means he has to get some racing luck. But he may be able to create some of his own, with a less crowed field in the Preakness. Race record: 10-2-3-2, with earnings now over $850,000. Ridden by Corey Lanerie, who made his first Preakness appearance in 2016, when he rode Cherry Wine to a second place finish behind Exaggerator. Lanerie’s grandfather was a trainer and his father, Gerald, was a jockey, who later trained, as well. Sire: Lookin at Lucky still does not have a G1 winner in the Northern Hemisphere. His best runner, to date, has been Madefromlucky, who won the G2 West Virginia Derby. Dam: Langara Lass won small stakes in Canada, at rural tracks at Hastings and Northlands. As his sire line would suggest, this sucker can run and run fast. After breaking his maiden at The Fairgrounds on March 18, winning a MSW, Multiplier – a son of The Factor — was entered in the Illinois Derby on April 22. With jockey James Graham at the helm, Multiplier laid back in 5th of the 7-horse field for much of the race, until they hit the top of the stretch. Then, he took off and won by a head over Hedge Fund, It’s Your Nickel, Stand and Cheer, and Hollywood Handsome (who came back to win an allowance at Churchill this past Saturday). Strangely enough, after one of the most masterful rides of his career, Graham was relieved of his duties and replaced by jockey Joel Rosario. Bad move. Trained by Brendan Walsh, who will be saddling his first Preakness starter. The 44YO Irishman got his trainer’s license here in 2011. Last year, Walsh set a career high with 4 Graded Stakes wins. Now ridden by Joel Rosario, who rode Creative Cause to a third place finish in the Preakness in 2012. Since then, Rosario was 4th with Derby winner Orb in 2013; second with Ride on Curlin in 2014; and second with longshot Tale of Verve, behind the great American Pharoah, in 2015. Sire is The Factor, who was a multiple Grades Stakes winner. The Factor won the G2 San Vicente; the G2 Rebel Stakes; the G1 Pat O’Brien Stakes, the G1 Malibu Stakes; the G2 San Carlos Stakes. Dam is Trippi Street, who was Graded Stakes-Placed winner of two races in five starts. The third dam was Halo Dotty, a multiple stakes winner who earned over $248,000. Trainer Ken McPeek purchased this colt for $95,000 as a yearling at the Keeneland September Sales in 2015. As a 2YO last year, Senior Investment finally broke his maiden in his fourth try – in a MSW event at The Fairgrounds on Dec. 26 (the day after Christmas). But the colt’s break-through race came this spring in the G3 Lexington Stakes at Keeneland. Sent off at odds of $11.10-to-1, Senior Investment rallied from next to last, swept four wide on the final turn and rallied to win going away. The itch was full on. After skipping the Derby, McPeek now has his top 3YO ready for racing’s biggest state – the second leg of the Triple Crown. McPeek gave the colt his last serious training session at Keeneland this week and shipped up to Maryland – ready to fire. Listen to McPeek on “The Pressbox Audiocast” this coming Friday night. Trained by Kenny McPeek, who has saddled three horses in the Preakness to date. Tejano Run finished 9th in 1995; Harlan’s Holiday ran 4th in 2002; and Rhapsody ran 4th in 2008. Ridden by Channing Hill, who made his Triple Crown debut in this year’s Derby, when he finished 17th on Spiral Stakes winner Fast and Accurate. Hill’s father, Allan Hill, was a 33-year veteran on the Nebraska circuit and won 667 races in his career. Sire: Discreetly Mine, a multiple GSW who earned nearly $800,000 in a distinguished career. He finished racing with a fine victory in the G1 King’s Bishop in 2010. Dam: Plaid, by Depty Commander. Plaid was Graded Stakes placed and won 13 times in 44 lifetimes starts, with 13 more seconds and 6 thirds. She accounted for $568,217 in career earnings. This son of Tiznow is coming into the Preakness Stakes off one of his worst performances ever – running 7th in the G1 Santa Anita Derby on April 8. But challenges and chances are not new to trainer Doug O’Neill. Despite the fact that his horse’s only ITM finish this year was an 81/4 length beating by Mastery in the G2 San Felipe, the O’Neill team is here to give fate a shot. Race Record: 9-2-1-2, with earnings over $170,000. Trained by Doug O’Neill, who has two Kentucky Derby wins under his belt already with I’ll Have Another and Nyquist. He won the Preakness with I’ll Have Another in 2012 and was 5th with Goldencents in 2013 and 3rd with the previously undefeated Nyquist a year ago. Ridden by Jose Ortiz, who will have his first Preakness mount. Sire: Tiznow, a two-time Breeders’ Cup Classic winner and 2009 Hall of Famer. Dam: Miles of Style, by Storm Cat. She was unraced, but the daughter of Tomisue’s Delight, a multiple Graded Stakes Winner, who earned over $1.2 million at the racetrack. Her greatest victories came in the G1 Personal Ensign Handicap at Saratoga, and the G1 Ruffian Handicap at Belmont. She ran second to Blushing K.D. In the 1997 Kentucky Oaks.